I keep on forgetting to post about it - sorry about that! The solstice happened on Thursday, Jun/21 making that day, the longest of the year. From then on, the days start getting shorter and shorter until the fall equinox on Sept/21 when the day and night are of equal lengths. So cockatoos and greys are still in season? I’ve never really been clear on what a short day breeder was. Well, that explains the white fluffy feathers all over the floor. They are hard to sweep with birds flying and kicking them back up. When I only had four, I bought a vacuum for the sunroom. The four got used to the noise. Now I have some who have been traumatized. I can't risk upsetting them. I need to find my robot vacuum. Since it is on the floor and just a fixture without a human it might work. Navre wrote: So cockatoos and greys are still in season? I’ve never really been clear on what a short day breeder was. Strictly speaking [in a more 'traditional' sense meaning applying to all species of animals], short day breeders are the species that go into breeding condition when the days start getting shorter while long day breeders are the ones that go into condition when the days start getting longer. For example, horses are long day breeders [they give birth in the spring] and sheep are short day breeders [they give birth in the fall]. In birds, for example, you have the IRNs that go into breeding condition when there are only 10 hours of daylight because this would give them enough time to incubate and raise their young BEFORE the monsoon comes -which happens when there are a bit more than 13 hours of daylight and when long day breeders, like canaries, would be sitting on their first clutch of eggs. It's the same thing with the grays, they breed during the dry season when the days are shorter and the temperature lower so they are 'done' by the time the 'wet' begins. But, in the wild, short day parrots like IRNs, cockatoos and grays which, to us, have two breeding seasons [very early spring and late summer] have only one [the one that would be the second to us]. It's only that captivity kind of makes the other triggers [food and weather] much stronger than in the wild because they are always ideal for breeding and, as they don't actually have any young to raise, their bodies decide to try again once the daylight hours hits the right number for reproducing. I’m printing that post for the rescue. Good info. Thanks. I wrote this using your info to post for the volunteers at the rescue. The solstice happened on Thursday, Jun 21 making that day, the longest of the year. From then on, the days start getting shorter and shorter until the fall equinox on Sept 21 when the day and night are of equal lengths. For us, bird keepers, it means that the long-day species will be soon abandoning their nesting behavior and then go into molt. But, for the ones that have short-day breeders (Greys, Cockatoos, Indian Ring necks) it means that they will be going into their second ‘clutch.' Anybody who has a cockatoo that has been kept at a strict solar schedule for some time can tell you that they are back to chewing in earnest. Strictly speaking [in a more 'traditional' sense meaning applying to all species of animals], short day breeders are the species that go into breeding condition when the days start getting shorter while long day breeders are the ones that go into condition when the days start getting longer. For example, horses are long day breeders [they give birth in the spring] and sheep are short day breeders [they give birth in the fall]. In birds, for example, you have the IRNs that go into breeding condition when there are only 10 hours of daylight because this would give them enough time to incubate and raise their young BEFORE the monsoon comes. It's the same thing with the grays, they breed during the dry season when the days are shorter and the temperature lower so they are 'done' by the time the 'wet' begins. In the wild, short day parrots like IRNs, cockatoos and greys which, in captivity, have two breeding seasons [very early spring and late summer] have only one [the late summer one]. In captivity, food is always plentiful, and the birds are not having to deal with things like lack of water, or too much rain, etc. Because of this the birds’ bodies decide to try again once the daylight hours hits the right number for reproducing. That “right” number of hours will occur twice, on opposite sides of the solstice. This cycle in birds is dependent on their exposure to light, and their exposure to the different wavelengths of light that occur at dusk and dawn. Their bodies adjust as the days lengthen and shorten. It’s the primary driver of their hormones. A bird kept on a human light schedule, a random light schedule, or a bird exposed to artificial light after dark, or artificial darkness during the day, can get messed up. Some people have birds who are “always” hormonal. If this is the case, you may want to look at your light management. If you like to watch Game of Thrones (is that still on?) with your bird at 11PM, you may be asking for trouble. I know people who have birds on totally horrible light schedules who have no problem with hormones. Whatever works for you works for you, but If you have a constantly hormonal bird, a constantly depressed bird, or a plucking/screaming bird, you may want to look at light management. If you want to see the science and research behind my rantings and ramblings about light, search for papers on “avian photoperiodism.” Don’t read them. They’re long and boring and not written for lay people. My friend Bea has done the reading and translated it into English for me. They are not 'long and boring' if you are interested in the subject. But it is true that it requires A LOT of research because it's not only avian photoperiodism, it's also avian reproduction and avian endocrine system PLUS you need to do research on each species. For example, in order to figure out why and when IRNs start producing sexual hormones you have to first find out when they breed in the wild and how long is the incubation period, then you have to look for the number of hours of daylight there is at the beginning of the season [when they first start producing the hormones] and at the time of hatching by going to an international sunrise and sunset schedule. After that, you need to check the weather cycles before, during and after to see the reason for that particular species breeding at that precise time has to do with just weather or if it's also some sort of special food availability because there could be a weather trigger [like cockatiels coming into condition if you bathe them a lot because, in the wild, they start going into breeding condition during the rains] or there could be a food trigger as in the case of birds that need a certain special food that is only found at a specific time only [like the red knots that eat the horseshoe crab eggs]. Birds are soooo cool! That was more to say to the volunteers that I don’t really expect them to read the papers, but if they want to argue, they have to read the papers first. It’s my attempt at footnoting! Light management is where we do the worst at the rescue. Every day we open and close at different times. I leave the house at 0300 to get there to open by sunrise, but I never stay until sunset at this time of year. That would make about a 20 hour day for me once I figure in commuting. I like to get there at sunrise because it gives no daylight hours for a bird to get into trouble if they have escaped overnight. Also, if a bird has managed to throw his water bowl, it give him no “awake” hours to be without water. Also, I like to get the birds their chop and nectar right at dawn. They eat a lot more of it that way. I don't get to mine by dawn. My birds are far from starving. When I put their morning food down they always let Phoenix and Gimpy get to the food first before they trickle down to the food. It's not a matter of whether they starve or not, Liz. You can feed a bird at any time during the day and it will not starve... Geez, you can feed a bird in the middle of the night and, as long as you turn on the lights, it will eat and not starve. The thing with feeding at the same time they are hard-wired to eat in the wild is healthy because it's what nature determined it's the right thing to do. Nature took hundreds of thousands [even millions!] of years of tweaking and tweaking to get to the perfect final 'product' and thinking that we know more than nature is foolish to say the least [and I am not even going to go into the arrogance part of it!]. 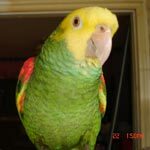 Parrots suffer terribly in captivity -both physically and emotionally- because the conditions we keep them under are so very unnatural so, anything we can do to make their lives closer to what they evolved to have would reduce the stress and improve their health. Is it easy? No, it's most definitely not. It's a pain in the neck to get up when dawn begins to break and it's a bigger pain the neck to adjust one's routines and needs to theirs but, if one is a responsible and caring owner and wants a healthy and relatively content bird, there is no real choice about it: it has to be done.